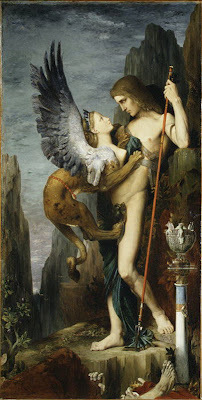 YESTERDAY'S SPHINX POST REMINDED ME OF ONE OF MY FAVOURITE GUSTAVE MOREAU PAINTINGS, OEDIPUS AND THE SPHINX WHICH IS IN THE MET IN NEW YORK. I FIRST SAW THIS PAINTING IN OCTOBER 2003 AND, BECAUSE OF THE SCALE OF THE PAINTING AND THE HEIGHT AT WHICH IT WAS HUNG, I WAS ATTRACTED BY THE FOOT AT THE BOTTOM RIGHT HAND CORNER OF THE PAINTING (I'VE GOT A DETAIL THAT I PHOTOGRAPHED WHILE VIEWING IT- I'LL HUNT THAT OUT). 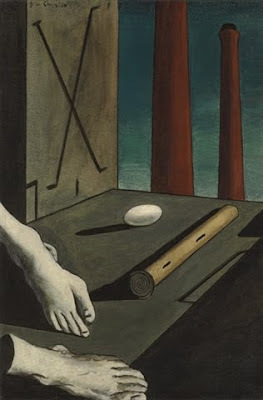 IT REMINDED ME OF THE PAINTING STYLE OF GIORGIO DE CHIRICO, IN THIS INSTANCE, HIS PAINTING COMPOSITION METAPHYSIQUE OF 1914 (BELOW). THIS PAINTING IS INFREQUENTLY REPRODUCED, BUT HAD STUCK IN MY HEAD. IT HAS TURNED UP A BIT RECENTLY THOUGH - IT SOLD FOR USD$6,130,500 LAST YEAR AT CHRISTIES AND HAS RECENTLY BEEN INCLUDED IN GIORGIO DE CHIRICO AT THE MUSEE D'ART MODERNE DE LA VILLE DE PARIS IN MAY THIS YEAR. THE FOOT IN THE MOREAU PAINTING IS PROBABLY A HUMAN REMAIN, A CAST-OFF OF THE SPHINX'S VICTIMS WHO COULDN'T ANSWER HER RIDDLE. THE DE CHIRICO FEET ARE CLASSICAL GREEK OR HELLENISTIC REMAINS THAT ADD FLAVOUR TO HIS METAPHYSICAL SOUP. I THINK WHAT INTERESTS ME IN THIS PAINTING IS THE FACT THAT ONE FOOT IS OBVIOUSLY FROM A STATUE, BUT THE OTHER IS CROPPED AT THE EDGE OF THE CANVAS, SO WE ONLY HAVE THE PALE COLOUR TO GO BY TO RELATE IT TO THE OTHER FOOT AS A POSSIBLE MARBLE. THIS IDEA IS REPEATED IN THE CHIMNEY STACK AND/OR OTHER CHIMNEY STACK, OR PERHAPS COLUMN; WHICH IN TURN RELATES, SCALE-WISE, TO THE FLUTE-SHAPED OBJECT LYING ON THE OBLIQUE PLANE BY THE EGG. GREAT STUFF.